Iconic footballers either leave their mark on football by exhibiting unforgettable performances in crucial matches, or by putting in a shift week in and week out, or by some combination of the two. These players have distinctive skills, distinctive ways of playing the game, and sometimes, distinctive appearances. With his graceful long pass, his viciously lethal ‘Maledetta,’ his masterful control of the game, and his flowing locks of hair, Andrea Pirlo is one of the most iconic players Italy has ever produced. But what if there was another player from the same region as him, who emerged from the same youth system, who played in the same role, and who possessed the same hairstyle? There is no need for anyone to imagine if such a person exists. Brescia, the club which produced Pirlo, currently possesses a starlet that is as close to a Pirlo clone as anyone could get. Sandro Tonali is yet to reach the lofty heights that “L’Architetto” ascended to in his prime, but the resemblances in playing style and appearance are remarkable, even if he is yet to grow a beard like the former midfield maestro did during his time at Juventus. 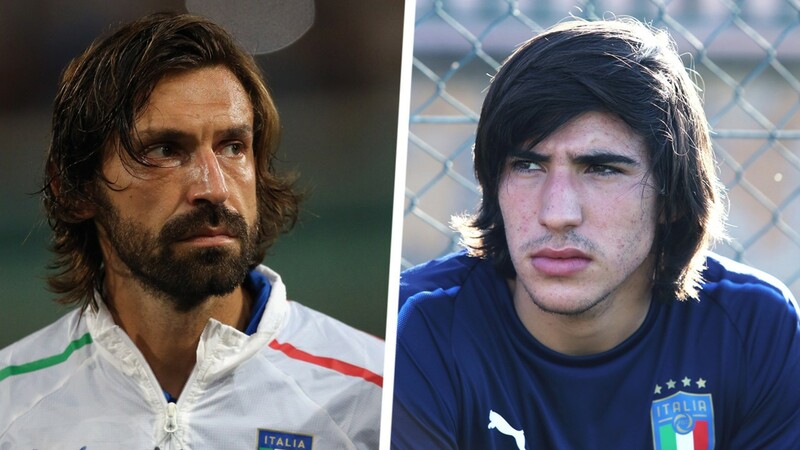 The 18-year-old was born in the Lombardian town of Lodi, while Pirlo originated some 80 kilometers away in Flero. The former Italy star made his senior debut for Brescia as a 16-year-old in the 1994/95 Serie A campaign, while the emerging starlet debuted for the Rondinelle on the opening day of the 2017/18 Serie B season at 17 years of age. Although Pirlo built his stellar reputation as a deep-lying playmaker, he began his career as an attacking midfielder before Brescia coach Carlo Mazzone changed his role in the second half of the 2000/01 season. Tonali, on the other hand, has predominantly played as a withdrawn playmaker, and he rarely played in any other position so far. Aside from all the Pirlo comparisons, why is Tonali lauded so highly despite having not played in Serie A yet? He is playmaker that plays with remarkable poise for someone his age. He knows when to play a short pass and when to play a long one. He favours his right foot but he can use his left one when needed, and he possesses a powerful shot. Despite making his debut in Round 1 of Serie B in 2017/18, the youngster had to wait until Round 23 to play his second match. This time, he was given the starting spot by coach Roberto Boscaglia. Although Brescia lost 2-0 to Palermo, he kept his place in the team, and only missed out on two more games for the remainder of the season. Tonali played 19 league matches last season, scoring twice and proving two assists. This season, he has been one of the first names in the starting line-up and he has featured in all 11 games so far, scoring once and providing four assists. His performance in the 4-2 victory against Hellas Verona on November 11 was the highlight of an outstanding breakout season for the teenager. He was indirectly involved in the first goal scored by Alfredo Donnarumma, threading in an immaculate, looping ball for the “pre-assist.” Then, he scored an indirect free kick from about 40 metres out, and he provided the assist for Donnarumma’s second. Since his promotion to the senior squad, the 18-year-old has already been under the guidance of Mazzone, Boscaglia, Ivo Pulga, David Suazo, Pasquale Marino, and now Eugenio Corini, who replaced Suazo from Round 4 of this season. A midfield playmaker himself during his playing days, the 48-year-old tactician came through the Brescia youth system before playing for Juventus for two seasons. He bounced around from club to club as a journeyman in the 1990s, but in the following decade, he helped both Chievo Verona and Palermo go from Serie B to UEFA Cup competitors. Tonali has improved his direct involvement in Brescia’s goals under Corini and the emerging midfielder has credited the current coach for this run of form. “Corini gives me a sackful of advice as well as specifics for my role,” Tonali told La Gazzetta dello Sport after the victory against Hellas Verona. Incredibly, the starlet has earned a call-up to the Italian senior squad, despite having never played for the Italy U-21 team. After a phenomenal tournament in last summer’s U19 Euros, in which Italy came within touching distance of the title, he seems to have skipped from U19 football to the real deal. Azzurri coach Roberto Mancini made some surprise selections for the upcoming international fixtures against Portugal and USA such as Stefano Sensi and the Brescia midfielder, but the former Inter and Manchester City tactician is eager to assess the playmaker’s ability to move up to the next level. “Sensi is a top player that deserves this chance, while Tonali is a great prospect and he’s physical,” Mancini said in his press conference on Monday. The likes of Juventus, Inter, Napoli, Monaco, and Chelsea amongst others are rumoured to be interested in his services, but Brescia president Massimo Cellino is reportedly asking for at least €20 million for anyone wanting to acquire the promising midfielder. For a player with no experience playing in Italy’s highest division, Tonali is already making a rapid rise, and to be selected for the senior national team of his country before turning 20 is no mean feat. Despite the early hype, it is up to him to cope with any expectations placed upon him and to create his own legacy. He needs time and patience to establish himself as a player in his own right, but one look at him and he easily evokes memories of Pirlo, a hero and maestro admired and missed by Italian football fans.